Unfair Advantage(R) versions 2.1.2 and earlier do not accommodate the expansion of the database to include more economic data and single stock futures. Therefore, anyone using one of these older versions will be receiving a new UA disk with version 2.3.5 and notice that starting on June 18th, their current version will no longer work. We apologize for the inconvenience, and appreciate your cooperation in keeping your software current as we move forward. It is hard to imagine that the Unfair Advantage® (UA) we released at the beginning of this young decade had much room for improvement, but the incredible scope of enhancements made over the past 18 months reveals that there is always room for improvement. At CSI, there is no stopping progress, and our staff has been diligently engineering and creating products that will serve investors well in this 21st Century. In case you missed them, here is a brief listing of enhancements, and a sneak preview of what's to come. In early 2000, CSI completely re-engineered the internals of Unfair Advantage so that it now uses a speedier, more efficient 32-bit platform. Although that major overhaul was invisible to the user, many more very significant and visible upgrades were soon to follow. For starters, we replaced the visual interface with a new screen that includes an adjustable charting window and portfolio listing. An interactive help feature was incorporated that allows users to view instructions on the current topic by pressing the F1 key. We also added CSI's Trading System Performance EvaluatorT to the menu. This system certification software allows traders to know the probability of repeating a profit with their trading system and to know the required capital to achieve a likely level of success. If you haven't had a chance to explore Unfair Advantage's new MarketScanner, T you should. Originally released as a limited version in early 2000 (called StockScanner), it was later reborn as a powerful, versatile screening and scanning tool that explores investment opportunities for both stock and futures exchanges. Continuous futures contracts such as back-adjusted or Perpetual Contract® data are now in the inventory of available time series, which include many hundreds of markets and up to 50,000 stocks and mutual funds tracked daily. The upgraded MarketScanner represents a milestone in support of custom studies. It facilitates user-defined analysis and includes a source library of new and innovative analytical tools. The library of sample PerlT programs holds all of the code necessary to conduct several studies, including a breakout system and an emerging market system, and illustrative studies such as Welles Wilder's RSI. Each study evaluates a simple or complex expression that will address all the stocks or futures series you have selected through the MarketScanner module. At any time, you may expand upon the library using Perl, Visual Basic or Java. You can act on your analysis results directly, or build a historical database for analysis with UA or third party software. UA charts can now graphically display custom studies, all of which are shared with MarketScanner. If your custom study includes buy and sell signals, UA will graphically display both realized and unrealized profit, and the crosshair readout will tell you the numerical values for all. You can also select from among multiple scaling techniques and set preferred bar spacing and color schemes for your UA charts. Naturally, the newly decimalized stock markets present no problem for UA, which accommodates a decimal representation of any stock into the distant past. Added precision is in the process of being incorporated into UA to accommodate penny stocks with greater accuracy. The Unfair Advantage software can also produce commodity charts that display in converted currencies. For example, you can look at the Korean stock market index in US dollars or Won, or you can view corn in dollars per contract in place of cents per bushel. Other examples include viewing dried cocoons in dollars per kilogram, yen per kilogram, d-marks per contract, etc. Thus, regardless of the exotic market you may wish to investigate, your risk exposure in your native currency becomes immediately apparent from the day-to-day price exposure details of the recent past. Studies currently available through UA's charting module include triple moving averages, Basis, RSI, Stochastics, Seasonal index, Moving Average Convergence/Divergence and, of course, the custom study library. Despite all these impressive changes and additions, UA has maintained the best of older versions, notable of which is the innovative MultiMarket AnalyzerT with the Davis Stretch Index, Davis Unstretched Indicator, Davis Elasticity Index and Davis Market Leadership Index. A fundamental change to the software that has made a huge difference to our customers is the support of multiple portfolios. Users may now select the format, directory and various other settings for individual portfolios that correspond to your different trading systems. For example, this allows the user of, say, Vantage Point and MetaStock® to simultaneously update and maintain unique portfolios that are appropriate to each application. Or you might simply separate commodities from stocks, financials from metals, or whatever breakdown you desire. UA can also import portfolios that match an existing database, thus simplifying the transition from another service. At the heart of our business is the CSI database itself, without which, none of our products would function at the level our customers have come to expect. Enhancements to the database have been ongoing since CSI was founded in 1970. An early 2000 addition is the valuable Commitment of Traders data (COT), inclusive of index support, which successfully called both the stock market drop and the recent change in sentiment. This information is provided courtesy of Steve Briese's Bullish Review. The COT information was later augmented with an impressive listing of fundamental economic data and government reports. Please see Tech Talk for more information on the economic data provided by CSI and suggestions on how to use it. Continuing the expansion in May of 2001, we further enhanced this portion of the database by adding some 350 Dow Jones Indexes(SM) to the inventory. We are in the process of compiling and certifying a ten-year history on these new series. As technology advances, the scope and content of the CSI database continue to be unrivaled. Data for every world futures exchange is available historically back to the very first day of trading for over 99% of the markets reported. All futures options are also available from the first trading day, and virtually every mutual fund is represented, complete with periodic dividends and capital gains reports. Nearly 50,000 world stocks and ADRs are included. With the introduction of new broad market and fundamental series, came subtle enhancements to the organization of data in UA's portfolio manager. It now allows for sorting by more refined market types, and within those types, by name, symbol, exchange, industry sector, CUSIP (coming soon) and country. Changes at CSI go much further than software and database enhancements. We have integrated greater web-based technical support and the earliest possible posting of various markets as they close. An example of enhanced communication with our subscribers is the new interactive "Current Posting Status" page found at www.csidata.com/ua/PostingStatus.htm. This up-to-the-minute report shows which categories of markets have been posted for the day, thus helping users avoid unsuccessful access attempts. Log on to our site and watch our daily progress before beginning your daily UA download. Our daily listing of links to important market-related news stories now includes a listing of current and historical exchange holidays around the world. This makes it easy for users of Unfair Advantage to recognize the cause of otherwise unexpected historical voids (such as foreign holidays, fires, bomb threats, etc.) in the database. For more information of this type, the user can check UA's "Events Calendar" under "Facts & Events" from the Database menu. Right now we are preparing another major UA release that will include Single Stock Futures and comprehensive world stock coverage from exchanges around the world. Universal stock CUSIP numbers that uniquely define each stock will be supplied in an upcoming release. UA's charting module will soon include our exclusive "At the Money Study" to show option-derived indicators of market significance levels. Also in an upcoming release will be support of our own "Any Language"T interpretive language. This very special module will facilitate the processing of the user's own source code, whether it be Basic, Perl, Fortran, or some other easy-to-formulate language that may be your preference. All in all, the current Unfair Advantage offers a broad range of features that make it truly unsurpassed in the investment industry. The program is packed with so many features, we couldn't possibly touch on them all in this brief article. Over the last year and a half, our customers have seen upgrades and additions occurring at a record pace. As we move briskly forward from this advanced state of services for investors, we always keep in mind these basic tenets: There is always room for improvement, and there is no stopping progress at CSI. 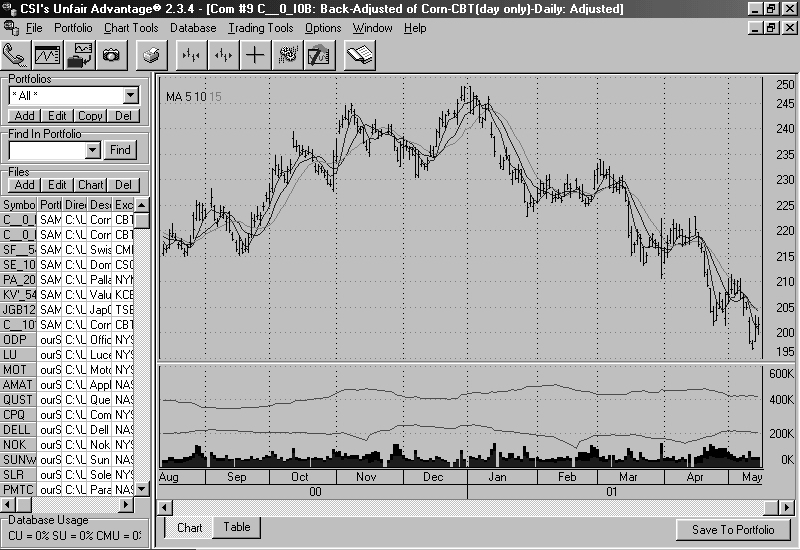 This UA screen shot shows the portfolio panel at left, tool bar and menu above and superb charting at right. The chart shown here has three moving averages, grid lines and daily price bars. User-selected options allow for virtually unlimited customization. The online Posting Schedule offers an up-to-the-minute summary of our progress in posting data to the CSI database. 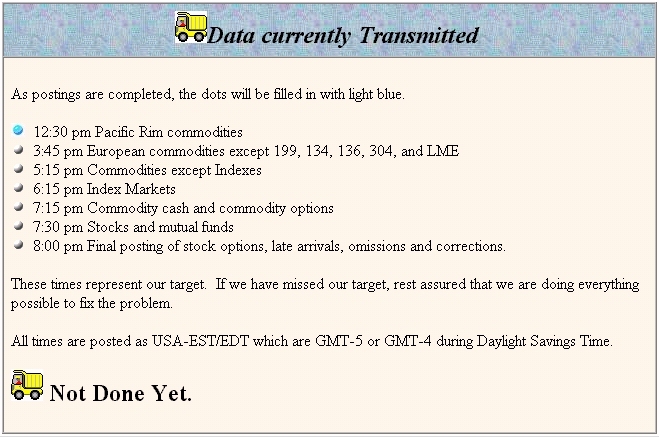 The web site shows a blue dot next to each type of data that is available for download or transmission. The bottom message says "Not Done Yet" until all time series have been updated. CSI's "Final" posting time each day is very often one hour earlier than the schedule shown above. 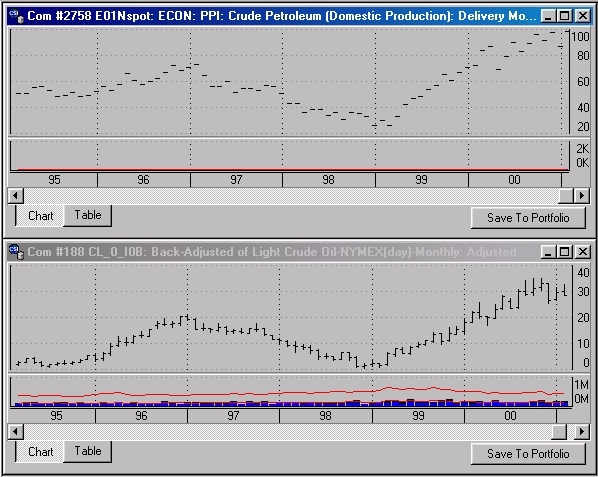 This double chart compares the Producer Price Index (PPI) for Domestic Crude Oil production with a back-adjusted continuous futures contract for NYMEX Light Crude Oil futures. PPI data is part of CSI's economic database that is updated monthly. UA accommodates monthly charts of any time series, as demonstrated here. We have made several recent modifications to UA affecting your unique portfolio needs. We recommend upgrading to UA version 2.3.5 to assure the best possible results. Contact CSI Technical Support to place your order. Thank you for your patience and cooperation.